Audi Q7 Running Costs, MPG, Economy, Reliability, Safety | What Car? The regular diesel Q7 is priced slightly above the Volvo XC90, but is still considerably cheaper than the Range Rover Sport and equivalent versions of the Land Rover Discovery. Sizeable discounts are available from dealers, and resale values are predicted to be strong and compare well with those of most other premium-badged SUVs. Higher CO2 emissions make the 45 TDI Q7 diesel models pricier to run as a company car than the XC90, although not by a huge amount. Insurance costs are also a little higher than average, but the Q7 is relatively affordable to service, thanks to long service intervals and Audi’s fixed-priced deals. All Q7s are well equipped, so even the entry-level Sport version shouldn't be dismissed. You'll find most of the features you'd expect from a car in this price bracket, including satellite navigation, dual-zone climate control, leather seats, 19in alloy wheels, a powered tailgate, xenon headlights and Audi's fantastic Virtual Cockpit 12.3in screen, which takes the place of traditional analogue instruments. The jump in cost to S line is substantial but gets you a sporty styling package, 20in alloy wheels, rear climate control, LED headlights, sports seats and adaptive air suspension. Black Edition and Vorsprung trims are dripping with luxuries but are very expensive. The latest Q7 didn't appear individually in our 2018 What Car? Reliability Survey, but Audi as a brand didn't put up a particularly good showing, finishing in 20th place out of 31 manufacturers. That's below BMW - whose X5 came top of the Luxury SUV segment of the same survey. The Q7 comes with a three-year, 60,000-mile manufacturer’s warranty as standard, and for a fee Audi will allow you to extend the warranty for up to five years and 90,000 miles. All versions come with active safety equipment, including automatic emergency braking, which alerts you to potential frontal collisions with cars or pedestrians and applies the brakes if necessary. Passive safety comes in the form of standard front and side airbags, plus curtain airbags that protect those in the front and middle seats. There’s no driver’s knee airbag, but rear side airbags, for the middle-row passengers, are on the options list. All six passenger seats have Isofix child seat mounting points and the Q7 also comes with a warning triangle and first aid kit. Optional safety kit (standard on Vorsrpung models) includes blindspot monitoring and lane-keep assist, and there's also a Trailer Assist system available if you plan to use your Audi for towing. 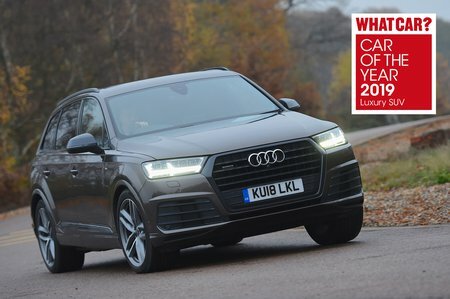 Euro NCAP award the Q7 five stars (out of five) for overall safety. A closer look at the scores reveals lower marks for adult occupant and pedestrian protection than the rival XC90 managed, but a better score for child occupant protection. Thatcham Research awarded every version of the Q7 five stars (out of five) for resistance to theft and four stars for guarding against being broken into.